Or . . . an Update on Our Battle with Ones and Zeroes! Or . . . a Rebuttal to The American Monkey Trap! meant to inspire thought about IT Governance . . . . If you’ve read my popular article, The American Monkey Trap, you know that it started in a car, one of the symbols of American Ingenuity. You also know it ended in a car, after a cell phone event . . . another symbol of American Ingenuity, only this time in an age when technology does not have to work. 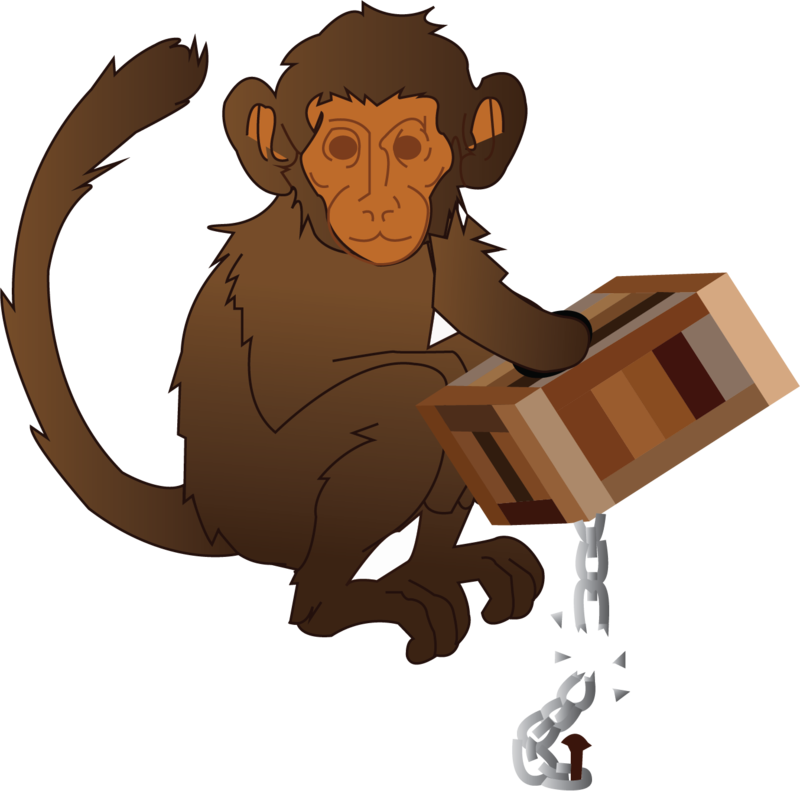 And it led to one of Sofia’s great drawings, of a monkey with his hand “on the banana” in a box chained to a stake. The hole in the box was just large enough for the monkey’s hand to fit through . . . as long as it did not have the banana in it! But last weekend, instead of letting go, I embraced technology, and I had an experience that helps me recognize the fallacy in my article. While I always knew in my mind that we humans have a relationship with technology, last weekend I learned this in my heart. I experienced it, while aware that I was experiencing it! You see, a relationship is NEVER a one-way street . . . Using Technology, While Remaining Free! yourself in 30 seconds,” and while worrying that we are more addicted to screens than we are to oil or greed or any of the terrible drugs we read about in the drug epidemics, knowing the hazards are similar . . . . I also now realize that the notion, “you get what you expect,” not only applies to relationships between people, but it also applies to relationships between systems. And between people and their systems. If The American Monkey Trap was all about expectations, I want this article to be about relationships. So if we start a relationship with unrealistic expectations, that relationship is going to have problems. But I have learned over my career of managing people that you get what you expect. For example, I’ve found that if you treat people like they are going to work really hard but love ever minute of it, they end up working really hard and loving it. If you treat people like you expect them to fail, then guess what? They fail. And I should NEVER write an article about relationships without bringing up my marriage, so this: When I got married, I expected to celebrate my sixtieth wedding anniversary, and this year we’ve made it to the halfway point! Yay! For those who don’t come to our infotex jam, “The Machine” is what I am calling the integration of my collection of keyboards, midi music, and sound recording equipment. For those who haven’t been forced to listen to me talk about what I do when I’m not blogging, “The Machine” fills way too much free time! But is time well spent! For almost two years now, I have been trying to integrate my entire music equipment collection, with the goal that at any one point I could record whatever is going on with the press of one button. Three weekends ago, I became very close to achieving that goal. But then I ran out of time. The next two weeks were ruthless time management obstacle courses . . . they were the start of my audit season. So as much as I wanted to, I could not get myself to “The Machine.” Even if I found the time, I was out of town. Still, my heart would regularly return to “The Machine,” at least in my mind, the entire two weeks that followed. I would daydream about the changes that needed to be made to the configuration so that my goal would finally be achieved. And then finally, last weekend, bliss. It didn’t come immediately, of course. I would make a change and, if it didn’t work, I would calmly try a different approach. But finally, in less than a couple hours into my Saturday morning . . . it was finished. “The Machine” was ready. Heck, I’m not even putting it in quotes anymore. And as I looked through my harmonica box, for the C harp that would accompany my first song on “The Machine,” I saw a little mixer in the box. WHAT ABOUT THAT MACHINE THAT MAKES MONEY? This little mixer was supposed to be used to make a microphone possible in my webinars. And just seeing the little mixer caused a noticeable change in my muscle tone. See, I do a lot of webinars for infotex, and the number one issue we have infrastructure-wise is that our sound quality stinks. We’re wanting to fix that by connecting a microphone to my laptop with a little mixer. And just seeing it caused my muscles to tense up on such a nice weekend. So when that little mixer didn’t work, I took the American Monkey Trap approach, and cast it aside. Somehow it made its way into my harmonica box. Who knows how. It was cast away, as yet another technology promise broken. My blood pressure. Is it rising? The reality did not hit me, at that time. There was the slight notice of my muscle tone tightening and my blood pressure rising, but then my heart brought my mind back to The Machine. And for that, I’m glad, because I was able to thoroughly enjoy The Machine. But Monday morning, when it was time to log into what I now call “The Little Machine,” I immediately switched from the weekend Dan . . . the calm, trial-and-error-is-fun technologist that “became one” with technology . . . to the frustrated-user-Dan that our network administrator has the privilege of knowing (by having to reset passwords). Because . . . thankfully . . . I noticed the change in tone again. (The immediate frustration was that the internet was saying “oh no you won’t” to my logging in, and I was starting to worry that I’d be late to a Client meeting). Okay, I admit, I totally cleaned up what I said. But the part that I didn’t clean up . . . . “I’m paying . . . ” has caused a preconceived resentment in my attitude towards technology. One thing we need to recognize in relationships . . . if we come to the meeting already mad, we need to work through that anger before we get to what even caused the anger. So why am I angry when I use technology meant to make money, whereas I am totally calm and relaxed when I use technology meant to create art. The latter actually works far less reliably than the prior, so I can’t claim reliability as the cause. I had gone from a “no worries, we’ll find another way” relationship with technology to a “what a ripoff, this is wasting my time” relationship. No wonder technology wasn’t working for me. More importantly, when MUSIC technology didn’t work, it was almost as if my reaction was, “awww, poor thing. Let me scratch and we’ll find the itch.” It was almost like I treated The Machine as a patient, waiting for me to heal its disease. Whereas, when the COMMERCIAL technology “I rely upon” didn’t work, I felt ripped off, frustrated for sure. And because I was paying attention, I also detected another emotion . . . BETRAYAL. I paid blah blah, and it betrayed me!! Most importantly, I felt like it was ME who was the victim. It was ME, not the technology, who suffered from the disease. I’m going to continue working on the why, but for this article, I want to share the results of a slight shift in my attitude towards technology, in how things have improved since last weekend. (I write this on a Friday, trying to get one last article finished before I go back . . . frankly . . . to The Machine). But due to an attitude shift, I have enjoyed technology much more at work. I still suffer login issues, but my reaction is more calm. And I am still adamantly exercising the lesson of The American Monkey Trap (don’t use the technology). For example, when AT&T says “oh no you won’t” to letting me log in with my computer to read email, I use my cell phone to read email, instead of waste time trying to log in with my computer. But the difference is, I no longer allow myself to get angry over the fact that I have to switch to my cell phone. Why? I think it’s because I now see the technology, not myself, as the victim. But by being aware of the notion that I have a relationship with technology, and that you get what you expect, I have been able to be more productive JUST BECAUSE OF THAT AWARENESS. And the results are empirical. Fortunately for me, we measure every six minutes of our time at infotex, using The Little Machine, and “authenticating” has actually taken less time this week than prior weeks. Specifically, I am averaging .2 hours per day (so far) logging in this week, where authentication was .435 the three weeks prior. (Yes, we track authentication as a category, because of my internet issues). I think the decrease in authentication time is due to a shift in my attitude: instead of seeing commercial technology as my enemy, I’m trying to see it as my friend. Instead of seeing commercial technology as a “technology promise broken,” I’m seeing it as “The Little Machine.” And I’m actually getting “the little mixer” out of my harmonica box this weekend. I’m going to find that itch, and my next webinar will star a better voice, through a better microphone.